The most important chart you need to know today is the yield curve. But don’t yawn, it has huge implications for the economy and your portfolio. Financial markets are nervously watching the slope of the yield curve, specifically from the 2-year treasury to the 10-year treasury. These are the bellwether federal debt securities that lie at the slope of the yield curve. It wasn’t so long ago economists were forecasting a 10-year note to yield 3% plus. The current rate is 2.879% as of the close today. The 2 year Treasury note fell as well today to close at 2.641%. The yield between the 2 year Treasury note and the 10 year Treasury note is considered normalized when the shorter term securities are yielding less than the longer term securities. This is because of risk, primarily. The longer you go out in time into the future, the more risk you maintain. Even though treasury notes are considered risk free securities, they will fluctuate in price until the day of maturity. 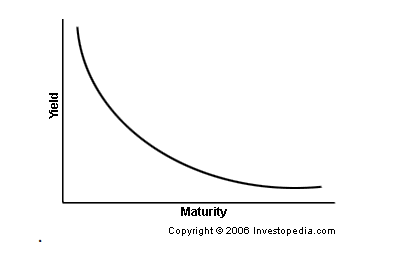 The following chart depicts a normalized yield curve. 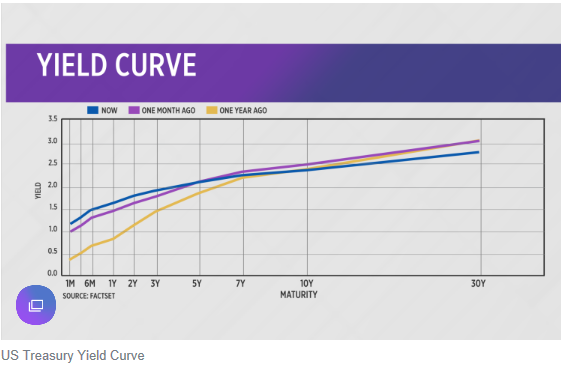 When the yield curve begins to flatten, meaning the slope of the line decreases, the spread between the short-term and longer term rates narrows. This reduces the returns of banks who pay the short-term rates to account holders, while lending at the longer term or higher rates. The difference is their profit. The current yield curve is in this flattening mode. 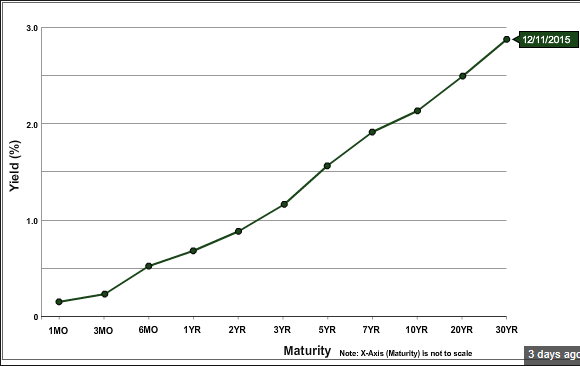 Notice on this chart that the higher yields are offered at the shorter maturities. Not only is this an issue to financial institutions, who will almost always suffer under this inversion, but the inverted yield curve is widely seen as a leading indicator of economic recession. On its face, concern about an inverted curve does not seem unwarranted. 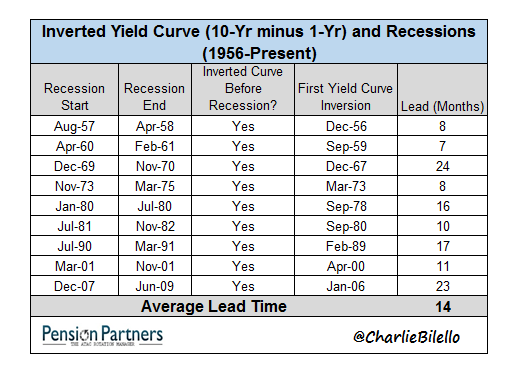 The last 9 recessions in the US were all preceded by inversion, with 1-year Treasury yields rising above 10-year yields. The current target range for the federal funds rate is 1.75 percent to 2 percent. 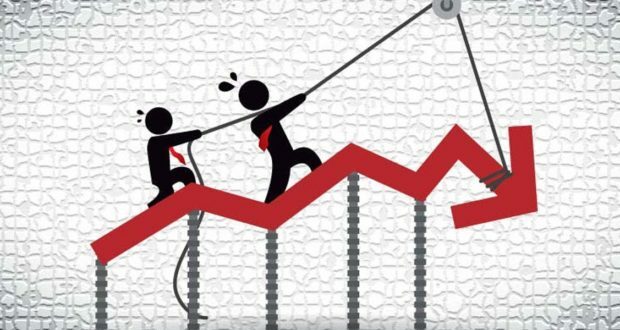 The June projections show most FOMC participants see the neutral interest rate at around 2.75 percent to 3 percent, with the median estimate for a fed funds target range of 3 percent to 3.25 percent by the end of 2019. Macroeconomic indicators such as employment and inflation have much to do with the sentiment regarding the federal funds rate. New York Fed President John Williams stated during a recent event in Buffalo that, “this is about as good as it gets” in terms of achieving the Fed’s dual mandate of maximum employment and low, stable inflation. If the yield curve does become inverted at some point, we will see if its use as a recession leading indicator comes again to fruition.